Energy is crucial to human well-being and to the socio-economical and health-environmental development of a country; conversely the situation of energy access is far for being a right for all: more than 2 billion people worldwide have no electric power and no hope of connecting on a national utility grid and an additional billion people have access for less than five hours a day. This data shows that over ¼ of the world is without access to electricity, including not only emergent countries but also underdeveloped or remote areas in the United States (IEA, 2010). Despite of this situation, new countries are evolving at a rapid rate and they are striving to improve their quality of life: from several surveys, people rank improved lighting highest among a set of improvements desired for their houses and affirm that they would acquire an additional lamp for their house if they could afford them and the fuel. In order to change this situation, a series of worldwide movements are acting for ensuring the universal access to energy by 2030: this step is necessary in order to transform completely people lives, affording new opportunities to escape the poverty by assuring energy and lighting as an inclusive rather than exclusive service. Energy provides people the means to access several benefits such as the light in dark hours and proper lighting is the key element of successful, industrious communities as it provides significant socio-economic, health and environmental benefits such as new income generation opportunities for small businesses, longer and better illumination for studying, extending productive hours in the home as well as reducing indoor air pollution (Mills. & Jacobson, 2011). The energy access should be supported by valuable and innovative investment, abandoning the traditional notion of macro-grid and centralized energy schemes and focusing on the micro-scale. The new sustainable approach of energy and lighting for all is based on locally led schemes that will ensure people to have the power to challenge their poverty in an autonomous and functional way. From this point of view, renewable sources of energy are the best and most cost-effective options for providing an universal access to energy, reaching remote rural areas particularly via the use of solar mini-grids and solar home systems (SHS) and with the individual use of solar portable products. New sustainable lighting systems are available thanks to technical advances of both lighting sources, batteries and solar photovoltaic microfilms; in addition to this, a qualitative approach to the design of this solar portable lighting devices has generated a series of more performing products, focused on the consumer needs, activities and demands. These new upgraded solutions need innovative and more affordable commercial systems (economic sustainability) and a stronger education of the communities for a responsible use. On the other side of the world, self-sustainable lighting systems, for public and private communities, are starting to be seen as a sustainable and meaningful way to face the economical crisis also in the more mature societies at the beginning of the third industrial revolution (Rifkin, 2011). 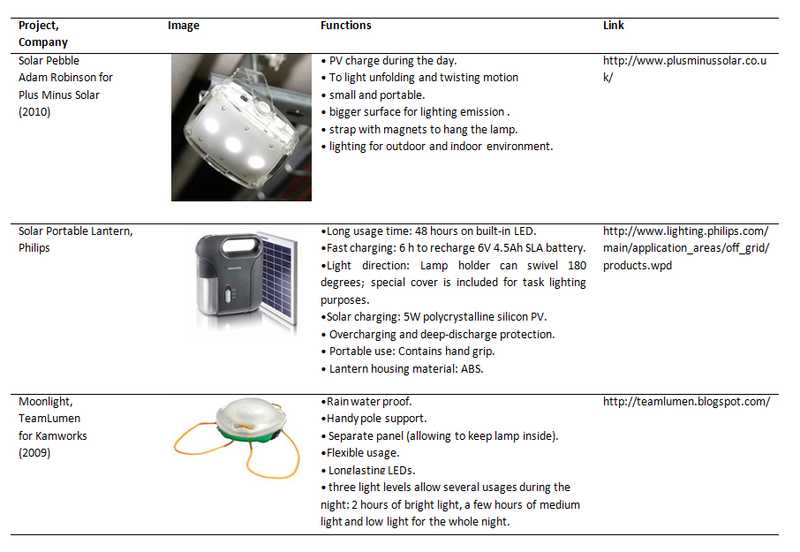 By combining the efficiency of light-emitting diodes with the durability of microfilm and more reliable batteries, new portable lighting system can be designed increasing the use of lighting from 2.7 to 4.4 hours per day (63%): a high-quality solar LED lantern can produce ten to one-hundred times the light levels as the baseline flame-based lantern (Alstone, Mills & Jacobson, 2011). In applications like the solar lighting lanterns, LEDs presents several distinct advantages over traditional lighting technologies (fuel-based systems, electrical filaments or gas light sources): compact miniaturized size, durability with an estimated life of 20 to 30 years, shock-resistance, directional lighting, lower operating costs and energy efficiency using from 50% to 90% less energy than other light sources while maintaining the same light output (Alstone, Mills & Jacobson, 2011; Granderson, 2008). The DOE estimates that LEDs will reach their maximum efficacy and lighting quality of around 250 lm/W by about 2020. Compared to other lighting sources such as incandescent and compact fluorescent, LEDs seems to be the most sustainable: they do not contain mercury, lead or other toxic chemicals and are completely recyclable. This translates into less localized hazardous waste at the end of the product’s life cycle. Despite of the fact that the production of LED is a very energy intensive process and does include dangerous chemicals, they do not contain mercury, lead or other toxic chemicals and are completely recyclable. In addition to this, LEDs permit the use of control options with timers, photocells or motion sensors and electronic intelligence that can arise the energy efficiency of the whole product, saving more energy when it is no needed. The current purchase cost of LED lighting products is higher than standard options and varies widely, with good quality products at a cost premium. However, the DOE reports that the cost per lumen of LEDs falls by a factor of ten every decade while the amount of light generated increases by a factor of twenty. 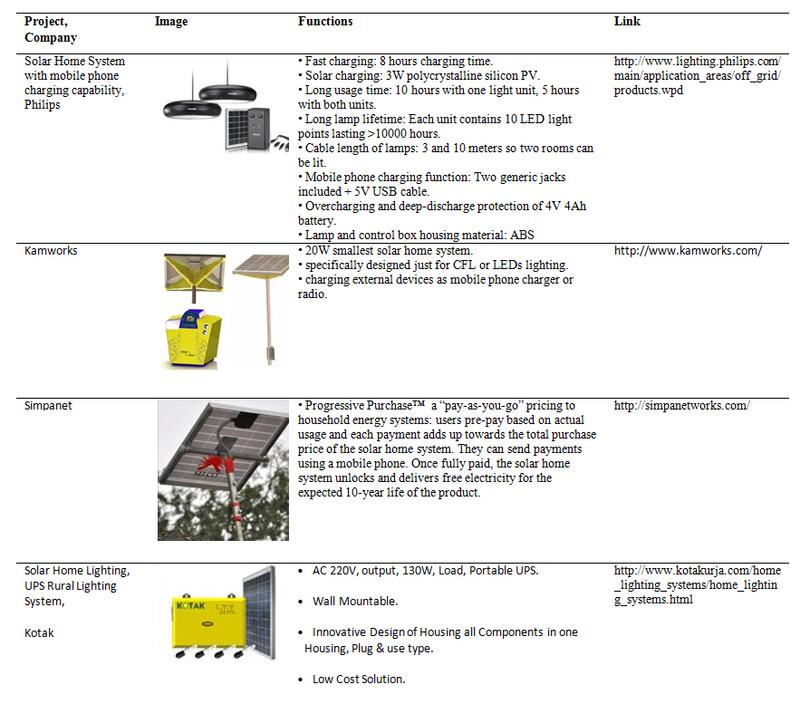 Low-costs and energy efficiency are providing new opportunities for designing simple, small and cheap products in order to assure energy and light, connecting remote and underserved countries, towns and villages to a self-efficient autonomous grid. Efficiency is a critical subject: light output, run times, and solar charging rates are directly dependant on the efficiency of the energy collection and energy use of these systems. 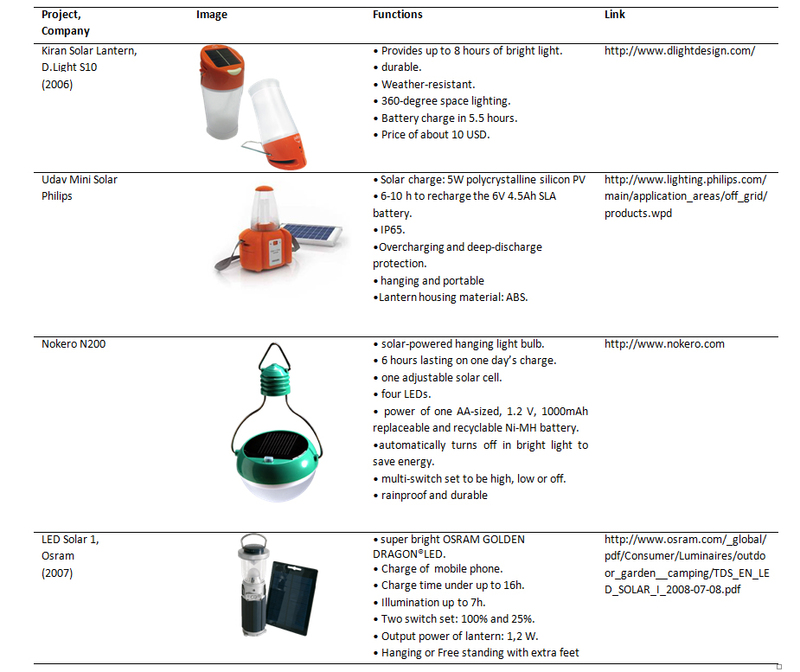 Solar portable lighting devices especially designed for emerging countries are focused on users and present an inner multi-quality capacity: this is relative to intended use, to material quality and physical functionality. Due to the lowering of the prices of LEDs, solar components, and batteries, solar lighting portable devices with consumer-orientated features have gained a longer life and provide better illumination with better and higher performance. Limited number of functionalities in order to keep prices low. Simplicity in the use for inexperienced consumers. Durable and robust to resist in rugged conditions. A higher focus on consumer and a better design approach has generated a new upgraded systems of Solar Portable LEDs lighting that present more adaptable form factor and additional features that are more sensitive to users’ needs and demands. In particular they present multiple recharge options, providing consumers with more robust charging solutions, for example solar and crank dynamo, providing more robust battery life. They can be equipped with multiple dimming settings, charge indicators and battery life notification enabling the consumers to better ration their light use. Battery life notification provides information to ensure adequate and correct charging that reduces wear on batteries. In addition to this, some product provide multi functionality enabling users with the ability of mobile charging. Flashlights/Torches: portable handheld devices offering directional lighting at low lumen output. Today’s solar torches typically feature integrated solar panels and offer the possibility to charge mobile phones and other electrical devices on the go. Ambient lamps /“lanterns”: portable or stationary devices that resemble the kerosene hurricane lamp form factor. They typically offer multi-directional light along with a wide variety of size and functionality depending on technology. Multi-functional devices: portable or stationary devices that can provide directional and multi directional light, a variety of value-added features (i.e. mobile phone recharge), and can be utilized for either task based or ambient lighting needs. Portable recharger: semi-wearable portable lights garments systems inserts tiny solar cells inserted into shirts, woven items and bags, sometimes even produced by remote communities in developing countries in order to suit technology to true social needs with a beneficial impact also in the productive local economies. This bags and wearable objects are able to generate lighting and also charge batteries for mobile phone in a portable, flexible and qualitative way. 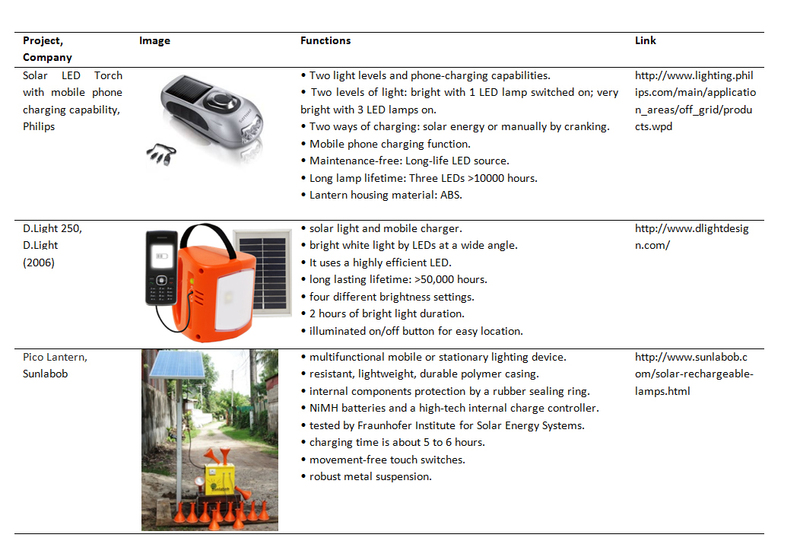 Micro-SHS: lighting devices associated with a small portable solar panel that powers or charges 1-3 small lights, mobile phones, and other low-power accessories (e.g., radio, mini-fan). Solar Home Systems (SHS) are the most prominent of these small-scale alternative technologies and are designed for rural family houses to replace current solutions as car batteries. On the other hand, the majority of the population is served by energy through a robust infrastructure able to assure the daily provision of electricity just by flipping a switch, clicking a remote control or even clapping hands: in developed countries, lighting, entertainment or communication in homes and offices is something taken for granted, available for people convenience without any special effort. If we think at the evolution of the domestic lighting in developed countries, we can recognize that the availability of electricity is just something new, a progress of modern society that has linked people to a centralized power generator, enabling a better quality of life while disabling the energetic autonomy that was assured by previously technology. The overwhelming access to electricity and the lighting dependence of developed country results in macro-problems that are getting more and more evident: the increasing intensity of global energy consumption and the dependency to private business companies that are able to judge and decide prices and supply of energy at their own discretion. The rising costs of oil, the aggressive weather phenomena, black-outs and other emergency situations have already shown that we, mature developed societies, are not able to face the lack of electricity access in a quick and effective way. From this point of view, all the previously described solutions of solar lighting systems studied to help consumers in emerging nations, are also offering consumers in mature societies a chance to lead more sustainable and meaningful lives: the idea, linked with the third industrial revolution described by Rifkin (2011) is that now it is the time to change toward a more ecologically responsible lifestyle. The new democratization of energy that will assure a complete economical, political and relational change, will also transform the way people use lighting systems in their private house but also in public spaces for new performances, new sustainable behaviours and self-autonomous energy provision. SPL products and SHS systems provide simple, cheap and well-designed solution toward the new sustainability of developed countries: cheapness will be the driving feature for the diffusion and affordability of these products because of recession and the reduced spending power; aesthetic and good design are the drivers for the improved social acceptability in public use of the cities. What would happen if every person and community across the globe had access to free energy and good lighting? What would happen to the social and economic make up of their towns and cities? What if we, developed and consumer societies would de-growth their lifestyle, changing for a more simple and energetically responsible attitude? What would happen to their town and cities? This article is not answering all the questions, but conversely it is about investigating the problem of lighting quality and comfort for all people worldwide and, presenting thoughtful quotes and best practice examples, it is an inquiry about the possible scenarios of lighting sustainability for all the globe. The scenario of de-growth depicted by Latouche (2008) and of democratization of energy by Rifkin (2011) are letting us imagining new systems based upon a different logic toward a more sober living, suggesting to consume less but better, to produce less waste and to recycle more, to collect clean energies and share with others such as communication, information in a sort of collective community in order to face the energy, pollution and food crisis that are expected in the next decades. In short, their scenario suggests to regain a sense of proportion and a sustainable ecological footprint: sustainable and portable lighting systems should be beneficial to both environment and society improving people, making lighting inclusive rather than exclusive, giving the benefits of a good illumination to all. Looking at the possibility to convert mature consumer societies in sustainable and autonomous energetic communities, we should recognize the inherent differences that exist between the old and the new means of energy productions and the change they will define in our cities, towns, quarters and homes: macro energy installations in the landscape should integrate with their surroundings both visually and environmentally; in addition to them, more and more micro installations should integrate with the urban communities in term of design and usage.